Sam Foster sent me the link to this article in The Hill (via Weasel Zippers) describing how liberal groups like MoveOn.org and unions are organizing massive revolts at Republican town hall meetings. He asked if any of these people might show up at Ann Marie Buerkle’s meetings. I said I didn’t know, but then I read the article. Democratic strategists believe their Tea Party moment has arrived. 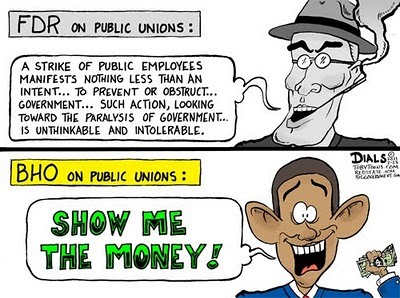 Working with labor unions and liberal groups, they are using the Presidents Day congressional recess to organize a public backlash against billions of dollars in cuts to federal programs. One labor organizer said that members have been urged to attend congressional town hall meetings to ask Republican lawmakers “pointed questions” about the cuts they supported last week. Justin Ruben, the executive director of MoveOn.org, a progressive advocacy group, has also encouraged members to grill lawmakers at town hall meetings. “Whenever we hear about a town hall meeting we encourage them to go and ask pointed questions about what is happening,” he said. 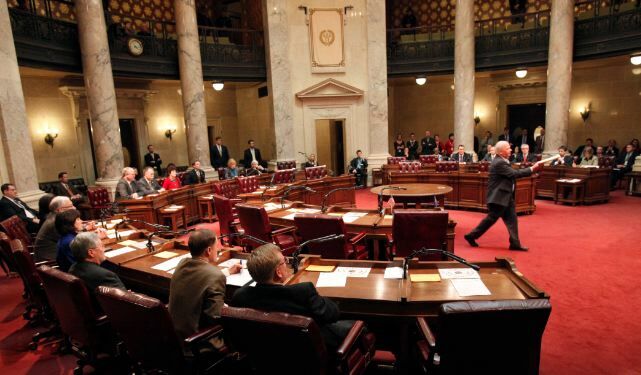 Stupid Union Thugs in Wisconsin yelling shame after a Budget vote. Are they against representative government or something? 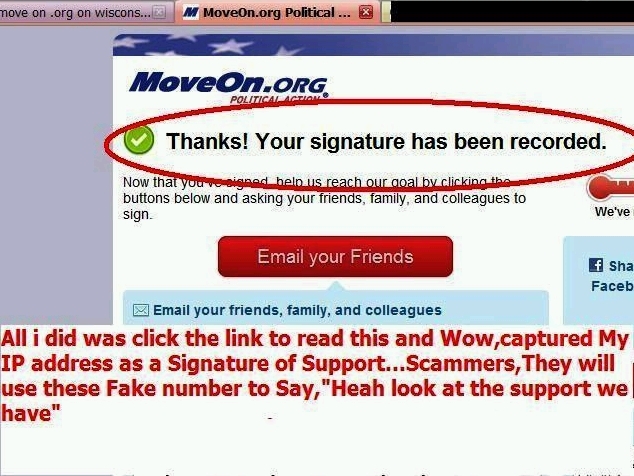 Thanks to AMORC11 of ‘Another Day at the Foundry’ there is solid proof that MoveOn.org is capturing IP’s, an underhanded dirty trick to fraudulently gather signatures of support for their “50-State Mobilization to Save the American Dream”. Video of Drugged out Union Thugs and Anarchist in Wisconsin. Keep these commies away from our children fire and arrest them now. The left has seized control of the country, the culture, the education system …… all of it. Very stealth, very smooth. 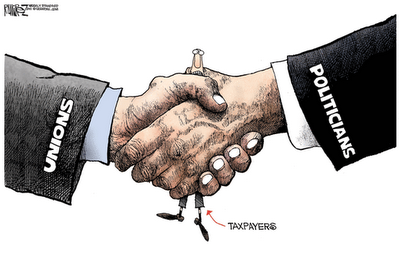 America is waking up to it — and man, oh man, are they in for a rude awakening. But this is who they are and what we are dealing with. Gird your loins. Meanwhile, while the left is robbing us blind and sentencing taxpaying Americans to what amounts to indentured servitude, the kids in Wisconsin, for example, can barely read. Sometimes it’s necessary to get out on the streets and “get a little bloody,” a Massachusetts Democrat said Tuesday in reference to labor battles in Wisconsin. 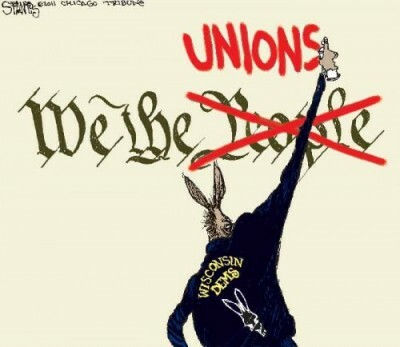 From http://gatewaypundit.rightnetwork.com/2011/02/voters-side-with-scott-walker-only-38-support-radical-gov-union-workers/Only 38% side with the democrats and government unions in the dispute. 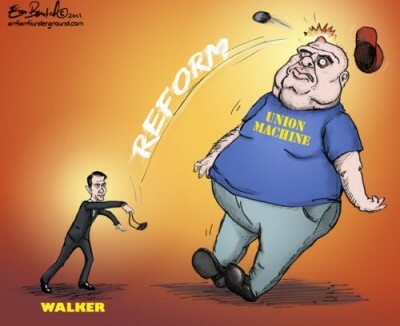 A sizable number of voters are following new Wisconsin Governor Scott Walker’s showdown with unionized public employees in his state, and nearly half side with the governor. In an effort to close the state’s sizable budget deficit, Walker is proposing to eliminate collective bargaining for public employees including teachers on everything but wage issues. He is excluding public safety workers such as policemen and firemen from his plan. We are a republic. 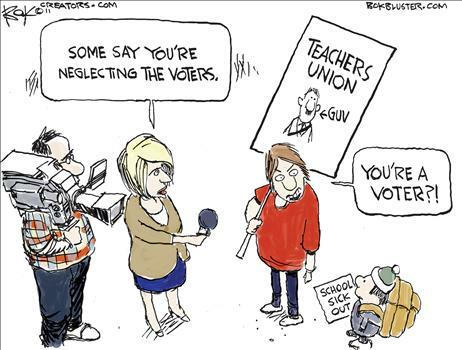 Union thugs are destroying it by crippling our legation. Immediate action is required IMHO unless we will fall prey to the Union Thug dictatorship. While on the streets of Madison, Wisconsin, Andrew Breitbart contracted a horrible case of Walker Pneumonia! He was diagnosed by a street “doctor” who was apparently handing out fraudulent Dr.’s excuses to union protesters. Not to worry, a second opinion by the “supervisor” rendered Andrew a clean bill of health. Praise Tea! THOUSANDS of Tea Party Patriots turned out today in Madison, Wisconsin, in support of Republican Governor Scott Walker and his plans to correct the state’s financial future. It was an amazing turnout considering the Saturday rally was only announced on Friday morning. Oh… And we paid our own way. 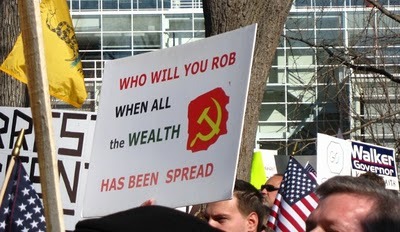 The tea party patriots filled the state capital grounds from the steps to the street over 100 yards back. There were so many Walker supporters there that you couldn’t here the speakers from the stage in the back of the crowd.